Looking for a tool to support students' comprehension during independent reading? 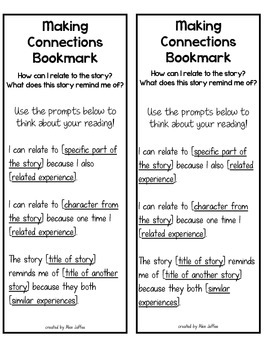 Students can use this bookmark as a guide for making connections during reading. The bookmark includes three sentence frames related to making connections to self, to world, and to another book. After a mini-lesson on making connections, my 2nd graders have used these sentence frames to respond to reading in their reading notebook during Readers' Workshop. I've also sent these bookmarks home to reinforce this comprehension strategy during nightly reading. Parents appreciate this reading support for home!